Paige Patterson, the President of Southwestern Baptist Theological Seminary, encouraged Calvinists to leave the SBC. I am a member of a Southern Baptist church. I am also a Calvinist. For those of you who belong to another denomination you may not be aware of the tension that exists between those who identify as Calvinists and those who do not. Personally I’m ok coexisting, but increasingly there is a vocal group within the Southern Baptist Convention who see Calvinism as a blight within the denomination. Arminianism — a set of doctrines, first elucidated by Jacob Arminius but based on exegesis of scripture, that concludes that unaided by the Holy Spirit, no person is able to respond to God’s will, yet salvation is conditioned on a person’s willingness to freely place their faith in Christ. For Arminians, the offer of grace by the Holy Spirit is resistible. I was reminded of this conflict, as it’s not really all that visible in my local church, when I read about a recent chapel service at the SBC’s largest seminary – Southwestern Baptist Theological Seminary in Ft. Worth, TX. I was troubled by the chapel speaker’s comments, but more so by what Dr. Paige Patterson, president of the seminary, said directly after. I know there are a fair number of you who think you are a Calvinist, but understand there is a denomination which represents that view. It’s called Presbyterian. I have great respect for them. Many of them, the vast majority of them, are brothers in Christ, and I honor their position, but if I held that position I would become a Presbyterian. I would not remain a Baptist, because the Baptist position from the time of the Anabaptists, really from the time of the New Testament, is very different. This tension is not unique among Southern Baptists there have been similar tensions within the Evangelical Free Church (I have served as a youth pastor and pastor in the EFCA) even though the factions have not been so organized. Also there is a detente that has taken place within the Evangelical Free Church which has taken a neutral stance on Calvinism, or the doctrines of grace, within their statement of faith. Unlike the Evangelical Free Church, the Southern Baptist Convention does take a position on eternal security so in that sense they have adopted at least one tenet of Calvinism formally. The Baptist Faith & Message takes a neutral stand on election. The primary difference influence of Arminianism is seen when looking Article III in the Baptist Faith & Message as it deals with the Doctrine of Man. “Inclined toward sin” is a statement that doesn’t reflect a view that man is totally depraved. I want to make two points here. 1. The “traditional” Southern Baptist soteriology is not actually traditional. The 1925 Baptist Faith & Message says this about the doctrine of man. Man was created by the special act of God, as recorded in Genesis. “So God created man in his own image, in the image of God created he him; male and female created he them” (Gen. 1:27). “And the Lord God formed man of the dust of the ground, and breathed into his nostrils the breath of life; and man became a living soul” (Gen. 2:7). Inheriting a corrupt nature and being “inclined toward sin” are significant differences. This change occurred in 1963. The statement on election has been virtually unchanged. Thomas S. Kidd, professor of history at Baylor University, points out that Calvinism is not new to Baptists. What I find interesting is that it was the Arminian Baptists who opposed the revivals happening during the Great Awakening. Only some of the “Particular” or “Regular” Baptists associated with the Philadelphia Association of Baptists (formed decades before the Great Awakening) supported the revivals. The General Baptists of New England, wary of interdenominational cooperation, mostly opposed the new revivalism. Doing so nearly ended the Arminian (free will) Baptist influence in America for about three decades. Their numbers dwindled and some Arminians joined Separate or other Calvinist Baptist congregations. Then if you look further back at the 1689 London Baptist Confession of Faith it very much embraced the Reformation view of soteriology which is Calvinistic. Kidd noted a decline in Calvinist influence among Baptists starting in 1830. Even so, the SBC’s doctrine of man did not change until 1963. Hardly the traditional view! 2. 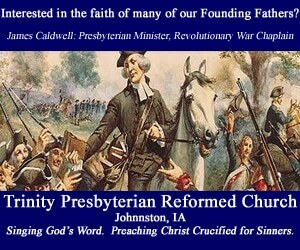 Calvinist Baptists are not the same as Presbyterians and Reformed Christians. The Presbyterian Church is not a natural home for Baptists who Calvinists as Patterson suggests. Being Presbyterian or being Reformed means much more than believing in the doctrines of grace. The primary difference is over baptism. I disagree with baptizing infants. Baptizing those who have professed their faith in Christ by immersion is the biblical model. I know many, many faithful believers who attend churches that practice infant baptism who believe differently, but it is one of the reasons I can’t become a member of a Presbyterian or Reformed church. Eschatology is another distinction. Many Presbyterians and Reformed Christians are amillennial or postmillennial. Most Baptists reject amillennialism and are typically premillennial. Also, Presbyterians and Reformed Christians embrace Covenant theology and Baptists lean towards to dispensationalism. Then there is the issue of church polity. Presbyterian and Reformed Churches use a presbyterian form of church government which is elder run. Not only do they have elders that oversee individual churches, but they are also under the delegated authority of a regional body of churches which is called a presbytery in the Presbyterian Church and a classis and an even broader body called a synod in the Reformed tradition. Most Baptist churches utilize a congregational form of government. This generally means each individual church is autonomous. That is the primary difference – there is not a regional body that has any authority over an individual church whether it is delegated or not. Baptist churches (and other congregational churches) can and do belong to different conventions, districts or associations that allows them toshare common beliefs, cooperate in joint ministry efforts and regulate clergy with other congregations. Congregations typically vote on different items during business meetings for members of the local church. Churches under the congregational system vary however with some being led by a single elder/pastor and other churches have a plurality of elders and the level of congregational involvement and decision-making varies by church. These are not the only distinctions, but these are the major ones. I do not believe that Christ intended to have all of this dissension amongst His family. He never intended for man to do denominations only follow Him. If you believe in Christ and His finished work on the cross, enough with this man made foolishness. There were no Baptists or Lutherans etc amongst the disciples, only believers. Some Southern Baptists are also emphasizing a new form of congregational polity that has a strong elder rule. Even the EFCA about 10 years ago came within a whisker of dropping premillenialism from its statement of faith. Only a rearguard action from some for whom it was an essential doctrine stopped that. Thanks for commenting, good points. Calvinism did not start with Calvin. Arminianism did not start with Arminius. It goes back to Augustine, who had the position that Calvin took, and Pelageus. Pelageus took a more radical view than the Arminians. He was condemned as a heretic. But others took a position that was not as sympathetic to human free will. So, to be historically correct instead of using the popular terms, you would be either an Augustinian or a Semi-Pelagian. Yes, I understand that. This article wasn’t meant to trace the entire history of these theological positions. I just thought it ironic that the guy you quoted said that the SBC doctrine went all the way back to the New Testament. Clearly not. As a dispensational Calvinist (yes, I do use the term) I often wonder where I fit. I’m not aware of any label that fits. At least not one that is well known. The irony is that while Calvinists are happy to be called Augustinians, many Armnians deny being semi-:Pelagians. It is such a saddening series of events of late in the SBC. This seems to have also run it’s course over the life of the true church. The truth of the Gospel and the Glory of God found and expressed in His mercy on an utterly condemned humanity, where apart from His mercy have absolutely no hope or desire to reach out to that God, was beautifully illumined to us during the reformation in which the wonderful and sovereign work of God raised up men to bring that Light out from man’s religion and the darkness that is always the result of our great God removing His glory from them. When we reject the plain truths of His word, particularly His glory in salvation, does not God show us He removes His glory, His lampstands, His truth’s, the illumining work of discernment from them (Rev 2-3)? Do we not see how brothers from the past fought tirelessly to forewarn the church of this in England and Europe as the “downgrade” became more and more evident? Look at that result today! Europe is an absolute wasteland of a people who have “No knowledge or fear of God” and the apostate, ecumenical road right back to Rome is dead and lost. Why? Let’s look at the word of God revealed from the very mouth of our Lord in Luke 8:18 as He pronounced the same judgement on His beloved but apostate Israel Luke 8:18 18 “Take care then how you hear, for to the one who has, more will be given, and from the one who has not, even what he thinks that he has will be taken away.” The Holy Spirit also warned the church in Romans 11:22 22 Note then the kindness and the severity of God: severity toward those who have fallen, but God’s kindness to you, provided you continue in his kindness. Otherwise you too will be cut off. Why will she be cut off? Because of man centered religious pride and elevation of himself instead of fear, reverence and submission to the clear truths of God’s sovereign decretive will. The true church is clearly building the false apostate church that we see in 2 Tim 3,4 & 2 Thes 2. We have churches full of man centered unbelievers worshipping, leading through deacon rotations and election from a voting mixture of weak believers and blind, carnal unbelievers left perfectly comfortable through weak, man centered teaching and preaching. He will call His people out of her (Rev 17&18) but she will require a serious wakeup call to hear His voice…how clear and sad it is that we are well on this course. Prayerfully hopeful in the Lord and saddened just like those who trust and believe God’s word as they saw it unfolding before their very eyes! The following is a paper presented to Dr Kenneth Melchin for THO 4108, Grace and Christian Existence, on the topic of the Roman Catholic Scholastic underpinnings of the theology of Jacobus Arminius, 16th-17th century Reformed theologian. Good article! very well written! Thank you!